If you had told me a few years ago that even the worst of my son’s behavior could be linked to food, I would have said I agreed. I knew sugar and food dye were linked to behavioral problems in children, and as soon as I learned this, I removed them from his diet. We saw some improvement. But even as we continued to eat well and focus on whole, organic foods, some new behaviors were emerging: disturbing, disheartening behaviors that I was at a loss to handle. After a friend observed Camden’s behavior at the park one day, she suggested I remove wheat from his diet. Being the go-getter that I am, I removed all grains from our family’s diet. We all felt better (read more about how our radically changed diet improved all of our health here) and Camden’s behavior improved. Then we moved about a year later, and though we stuck with a mostly-paleo diet, we slacked off during the transition, then never really got back on track completely. We ate some gluten-free grains here and there, and even ate gluten on occasion. Without even realizing how much we had regressed on our diet, we noticed some new behaviors emerging in Camden. Since we homeschool, I am with my kids 24/7. After our move, I began to notice a strange shadow come over Camden from time to time. He would become unreasonably angry, sometimes for no real reason. He would lose his temper and lash out at his younger brothers, exhibiting a total lack of self control, that, at the age of 6 or 7, was developmentally abnormal. I knew it all went back to the food he was eating and a leaky gut, but I wasn’t sure of the exact culprit/s yet. The worst was trying to get schoolwork done. He flat wouldn’t do it, and instead, sat for hours, painstakingly writing one letter at a time, a whole sentence taking an hour or more to write. I was mystified. Camden is an incredibly smart kid. How could he not just get this done? Even though I knew I had some work to do to continue healing him, I took to the internet to research what might be going on. I came across Oppositional Defiant Disorder(ODD) and was able to check off every symptom and behavior for my son. While many people would assume the above symptoms are the evidence of a lack of discipline and appropriate parenting strategies, for a parent who knows their child, and knows this behavior is not the norm, and who has strived (and strived and strived) to remedy the behavior with discipline and redirection, these are symptoms of something greater, something that is not easily dealt with. Connecting the dots myself was disheartening enough; I didn’t need a diagnosis to confirm that Camden had this disorder. At some point, I began to determine foods that were causing these behaviors in Camden. Obviously, if he somehow got ahold of food coloring (which was rare, so it was easy to track), gluten, or too much sugar, the behaviors would crop up. But, I was able to link another food to the aggressive, defiant behavior: corn. We would still have organic corn chips in the house every once in a while, and I became certain that the corn chips were a major cause of ODD. I would observe him eat a few chips, then hours later turn into a different kid. After eating corn, Camden would become incredibly angry over seemingly small stuff. And there was no reasoning with him or helping him to see things from another perspective. We tried discipline during these times, and even spanked him, but this just made him more angry, and at times, he became physically aggressive in return. No brand or amount of discipline got through to him. This was one wave that we just had to ride out. Not too long after I began figuring all of this out, we moved again, back to our previous town. At this time, we had been avoiding corn with Camden, but moving once again took a toll and some convenience foods were eaten here and there. He basically just kept enough junk in his system to keep the ODD behaviors cropping up. Once we got settled, though, we were ready to get strict and steady with the diet, and we began to see a huge improvement. Today, a year after our most recent move, we avoid corn (and the other foods mentioned) like the plague for Camden. I read every label and we do not cheat. We know that if we do, there will be fall out, and it makes us all miserable. It’s just not worth it. And you know what? ODD is mostly a thing of that past! These days, even if that shadow comes over Camden for some unknown reason, it only lasts a few minutes instead of days at a time! We are seeing such huge improvement, and we will not go back. Between a strict diet and healing we’ve experienced with some biomedical interventions, I am confident that these little episodes will be fewer and farther in between, until they cease completely. For Camden, that means a normal life without unreasonable anger, being able to deal with disappointments and frustrations in a healthy way without exploding or feeling down about himself. Have you noticed your child reacting to a surprising food? 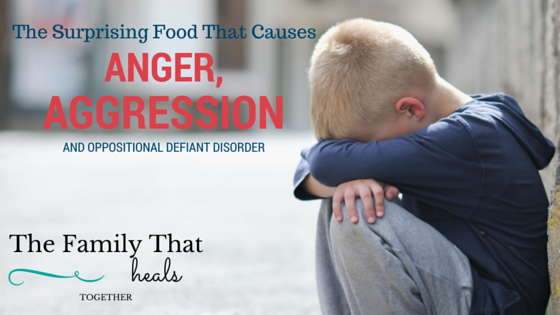 The Cause of Oppositional Defiant Disorder and the surprising food that causes symptoms like anger and aggression. I would like permission to re-post this on DRAH with link backs to your blog, a profile pic and a short bio. Let me know what you think via email. Thank you! My stepson was dx when he was 5. The pediatrics office had us do a Conners test…(ODD TEST) and sure enough we removed most all sugar and watch red dyes. Never even thought about the corn as a symptom cause just the carbs from corn turn to sugar and then BAM…a huge mistake on our ends. Odd is very hard and very stressful to manage and I am burnt out. My stepson is now 11 and it’s better but by far not even close to bring over. I’m so sorry, Kate. I agree, it is very hard and stressful to deal with. Keep fighting, momma! You will continue to find things that help. We are currently on the GAPS intro diet and it is helping as well. Have you looked into PANDAS/PANS? That might lead you to some more clues and some test you could have run, such as strep antibodies. My grandson was dx with ODD and ADHD, severe mood & emotional disorders and he just turned 5 in Dec 2015. We have dealt with his aggressive behavior since he was about 3yo .. They also thought he was on the autism spectrum but they said he was “to social” to give him that dx even though we believe their 15 min eval was incorrect .. He’s always had a speech problem in that we’ve always had a hard time understanding him and his older sister would “interpret” for us .. Still it’s hard to understand him and up until this past year he wouldn’t/couldn’t call me Grandma but would say “Hey” if talking to me. He’s been to 2 psych hosp’s that said he was an angel and they’d take him home but at regular Hosp before taken to psych Hosp security had to be in the room to restrain him due to his behavior as well as we’ve called the police as advised and one time they took him in a rage to the ER. Plus pediatrician had him on meds for his behavior but it didn’t really help. With all this said we still can not get ANYONE to help or direct us how to help him and his aggressive behavior has put holes in my walls, broken glass in a china cabinet, a stair railing pulled almost off the wall, left bruises on myself and granddaughter that look like a grown man hit us .. But disturbingly tends to go after and direct his anger at his sister who is 9 so she has to go to her room or another room with a lick to avoid him .. The pediatrician said he was going to remove him from our home as if my daughter was creating the problem but the 8 yo and 1 yo do not act like him so it’s not a home environment issue .. Plus he has sensory issues and one mental health person said had she not witnessed his behavior personally she’d of not believed it .. Sorry for the length of this but with what I’ve stated I wonder after reading your article if something as simple as changing what he eats could/would help .. He’s already a picky eater and won’t eat a lot of things or try new things so what book or “diet” would you recommend? Not sure how to know what all to try to eliminate to see if we see any changes and how long it could take to see any changes .. As you can see we’re grasping at anything since we can’t seem to get professional help for him .. Thank you for reading my long post and any suggestions/directions you can provide. Hello Rhonda. I am so, so sorry to hear about the difficulty you’ve had with your grandson. I believe he would, indeed, be helped by diet changes. There is so much I’d love to share with you, but let’s keep things simple. 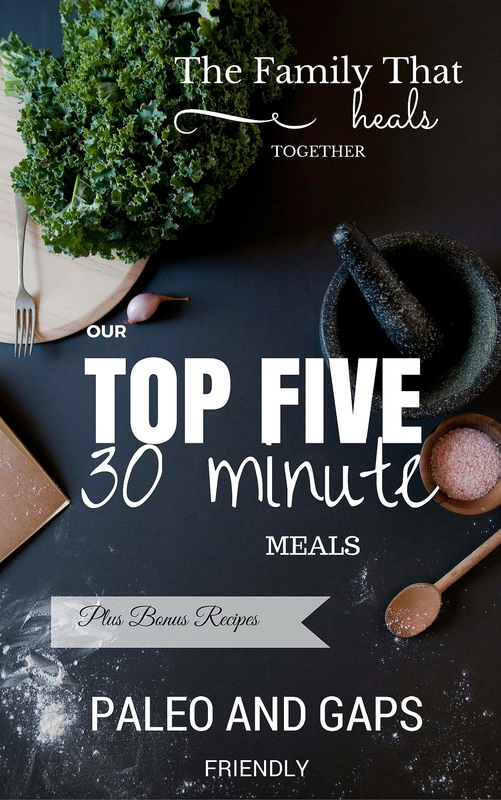 First, read this post I shared recently that will give you a starting point for removal of problem foods and ingredients: https://www.thefamilythathealstogether.com/heal-behavioral-disorders-remove-these-ingredients-from-your-childs-diet-now/ . This is where our family personally started. Second, look into PANDAS / PANS, a disorder with symptoms like you are describing that actually goes back to strep bacteria infection. Depending on where you are located, you may be able to find a PANDAS specialist who can help you. The first and foremost thing you can do for him is start to remove inflammatory foods. Once you’ve removed the things mentioned in the above article, move on to sugar, gluten, and dairy. Eventually a paleo diet will be helpful, and, ultimately the GAPS diet will help to heal his gut, where these problems originate. He likely has pathogenic overgrowth (possibly strep as well as other things) and changing his diet will help to stop feeding the pathogens and strengthen his immune system. Once you’ve gotten his diet on track, you can then gently begin to treat the pathogenic overload if you still need to. Look at the book Gut and Psychology Syndrome by Dr. Natasha Campbell-McBride for a huge source of information on healing the gut and detailed instructions to carry out the GAPS diet. Take it one step at a time and know that it will be hard work, but you CAN start healing and helping him. Feel free to email me jaclyn@thefamilythathealstogether.com if you’d like to discuss further. I’m praying for you family! Hi Rhonda, I was reading your comment, and it sounds so similar to what I’m going through with my son! He’s 7, was pretty much nonverbal besides echolalia until he was 3, and still was another year before he spoke more clearly. He tested sensitive to gluten in 2014, and I also cut out dyes and chocolate. He was diagnosed with autism and possible ADHD in March 2015. His behavior has gotten worse the older he gets. Fall 2015 I stopped restricting his diet because I didn’t think it helped. I can see now it has been worse since that time. February/March 2016 we were living in a moldy house and all of a sudden found out I had not outgrown my childhood allergies, including corn and soy, and have developed new allergies. We moved at the end of March. My son has been in behavioral hospitals 5 times since March. Frequent 911 calls since we moved. After dealing with my own allergies, I realized he has some allergic reactions (not just behavior) and started attempting to pinpoint them. He’s now off gluten, dairy, dyes, and chocolate. Also had allergy reactions to bananas. I hadn’t wanted to just assume corn allergy, because it’s hard enough with how picky he is. But yes, I’m now suspecting an actual corn allergy. When he got out of the behavioral hospital last week, he was sick for 2 days with vomiting and diarrhea. He didn’t really eat for over 2 days. He was being a sweet angel, and I was wondering “who is this kid?”. The upset stomach had cleansed his body of allergens I guess. When trying to find something he’d be willing to eat when he was better, he said pizza and ice cream. I got the safest ice cream I could (coconut milk), but I knew pizza would be tricky. I made him pizza with GF bread, GF sauce, and DF cheese, it was corny, but wound up being a good test. Over the next 3 days, he did relatively well with the ice cream. But the pizza, and even just the DF cheese, set him off bad, and along with behavior, increased his sniffles and cough. Driving down a road full of corn fields set him off as well. Definitely seeing the correlation now. As long as I could keep his food as safe as possible, he was the sweetest boy. He did wind up back in the behavioral hospital on the 4th day. I do believe it was airborne corn reaction. I didn’t want the hospital screwing things up but it was not safe for me or him to stay home. Finally have some professionals seeing this. I just realized I have to keep seeking help and be more vocal. His new therapist totally understands it, the ER manager gets it, the dietician at the behavioral hospital gets it. And we’re being pointed in the right direction for help I hope. I’ve been taking him to the ER or clinic when he’s sick, several times lately, just so they start knowing our situation and become willing to help. It’s starting to work. Hang in there, keep seeking help, and be vocal about the food corellation. I saw enough those few days to be positive food is the problem. My son was just discharged from the behavioral hospital again today, actually taken to the ER for dehydration (and mild allergic reaction) before he could be discharged, so I just had to go sign discharge papers afterward. By the time we left the ER he was more argumentative and prone to tantrums. I’m guessing it’ll take a couple of days of “detoxing”, watching his shows, to help, like last time. But I’m more hopeful now. Allergies are a pain, especially corn, but it’s an “easier” solution than anything else we’ve tried. Hi Rhonda, just read your comment about your grandson. This sounds familiar. Please check out Dr. John Bergman on YouTube. He is a “corrective” chiropractor, in Huntington Beach California. And note, not all chiropractors are “corrective”. The medication these ” medical Dr’s ” are giving to your grandson, as Dr. Bergman explains, are causing most of the problem. Dr. Bergman most likely will help you on the information you so desperately are seeking. I am now taking his courses on line and would eventually like to focus on young and old misdiagnosis with behavior. And keep up with Jaclyn’s recommendations on foods; cause that also is very important to not let our gov. Poison us and our children with all the unnatural additives. I’ve seen this with my son too! I imagine we have been on very similar paths! I’ve went through it with my son. I have done a diet published by the Royal Prince Alfred Hospital in Cidney Australia. The diet is also publsihed through the Food Intolerance Network. Amazing diet with amazing results. The same diet is described by Sue Dengate “The fedup Child” (may be purchased by Amazon). Not easy to follow but very powerful diet. Hi Vale. You never know, and all kids are different, but removing corn is worth a try! Why didn’t you have an ALCAT food and chemical sensitivity blood panel done? I am thinking this is what I will do with my 3.5 year old, exhibiting signs of ODD…and has been for the past 9 months. We’ve seen so many specialists…2 different pediatric neurologists; thought it was PANDAS and had an MRI and blood work only to show it isn’t (but it still might be PANS), an infectious disease doc. who did nothing, 3 different psychologist to rule out learning disabilities and autism, 3 different pediatricians, a social worker, an OT….nothing…..Should I see a naturaopathic Doc? A Dietitian? We eat a healthy diet…no artificial colors or sugars here, but I like the idea of dealing with this issue through diet vs. medication or crazy blood transfusions (for PANDAS anyway)….just not sure where to start…hence, the ALCAT panel. Any advice on that? Is it a waste of time and needle prick? Thanks for any advice! Your article describes my 4 yr old perfectly! We are at the end of our rope and need help!! I too have eliminated all wheat/grain and almost all unnatural sugars over the past year for myself and have noticed amazing results. My struggle is getting the rest of my family (most importantly my son) to eliminate all the food “he loves”. Any suggestions how to get my 4 and 6 yr old on board? Have u ever tried GMO organic corn products? There are some who think it’s not the corn but the GMO that causes a problem and seen it’s harder to get GMO free corn I was just wondering. Oh yes, organic corn caused problems as well. Thanks for the idea though! We had the same issue with my son and realized it was corn. However, he can eat all organic corn but nothing he totally modified. He was on the infant formula Neocate which is derived from organic corn. A nutritionist who wrote the book “what’s eating your child” thinks that when these Neocate children went to have gmo corn there bodies reacted to it as foreign. My daughter was also on Neocate and has a gmo corn allergy just not as bad! We really watch our diet and stick to whole foods. But there have been couple of times my dd has had a lollipop or M&Ms and Food coloring/sugar change her attitude and behavior so drastically you would think she was a different child. Food affects us more than we realize but once you start to get away from certain ingredients/processed food you can see how it does. Glad you were able to help your child and pin point what was causing his behavioral issues. Rhonda and Rhea Kali, I’m so sorry to hear your (and your childs’ stories). Did you ever look into Fragile X? I’m a Mom of a teenage ODD son. We’ve struggled for so long as a family. What diet tips would you be able to give me for a picky vegetarian. Hi Amy. Cutting sugar and food additives would be a good place to start. Following that, you may try removing dairy & gluten/grains, and eventually, if your son was willing, try to incorporate some nourishing animal-based foods, which contain nutrients we just can’t get from plant sources. Hi Jaclyn. I would like to know is the list posted above, of ingredients to remove from diet, what you removed and noticed improvements in your sons behavior? Hi Marisol. The most important changes we made were no gluten or corn. Did you find that you had to avoid even trace amounts of corn or corn derivatives? I just found that the “natural vegan flavors” in our favorite dairy free gf cheese is derived from corn. I’ll watch my daughter and see if she has a reaction, but it wasn’t labeled. I had to actually contact the company to see what the “natural flavors” were ?. My son was dxed with ADHD first, 4 months before his 6th birthday, and then the ODD bouts with all of the classic symptoms, in first grade. All of the hallmarks of a food based reaction we’re there, and I had ever read “Is This Your Child?” years ago. But I let myself be convinced for over 2 1/2 years that the ADHD and ODD medications we’re the right way to go…..at least until one medication caused my EIGHT year old to border on psychosis, and another depersonalized him. I wanted my happy, loving little boy back, so we removed him from psychiatric care and took a natural approach. For him, the biggest offender is milk, specifically the milk protein casein. He isn’t highly allergic, but is very sensitive. One glass of milk, a carton of yogurt, and it’s like a switch is flipped and he goes to the dark side. Compared to that huge change, other food sensitivities are possibly being overshadowed, so we still have to test gluten, dyes, and corn syrup, in that order. His pre-packaged snacks, like gummys or similar, I get in the organic section, and even still, I check for hidden artificial colors and flavors, as well as for any corn syrup under its many pseudonyms. I don’t like artificial crud in my own food, so no way do I want to give it to my family. My son is also not a huge sweets lover, and when he was young, he somehow got a drink of pop, and hated it, saying it was “too spicy” (the carbonation burned some). So we capitalized on that and just don’t let him have it. He’ll be 9 next month, and is among a pretty small handful of his peers who aren’t allowed to have pop. So it looks like gluten is our next elimination item. Luckily one bread we like is gluten free, but hunting for it in things not labeled is such a treat…..not! Just curious cause my son has ODD, where you ever prescribed Abilify or any other precriptions? We are doing therapy and meds. Episodes keep occuring. I agree, Jon! It’s not bad parenting; these kids are really dealing with some awful stuff. I have fought to keep my son off of conventional psychiatric meds, and so far we have not had to resort to them. He’s doing quite well now, as we are seeing a PANDAS specialist who is treating him with biomedical interventions. If your child has ODD, PANDAS/PANS is definitely worth looking into. When my son began head banging to the point of bruising himself, I finally gave in and had his doctor put him on Abilify. It did help with the severity of his symptoms, but was only masking them, not a cure. A few months later I removed gluten and casein from his diet and saw a miraculous improvement. Like night and day. 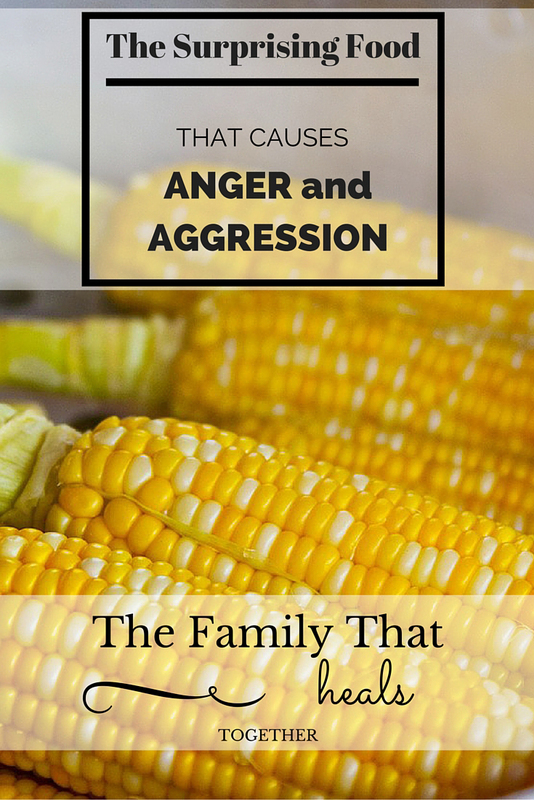 One accidental slip in these ingredients and he became aggressive and animal like – he would go into fight or flight mode and the whole family felt like we were walking on eggshells for 2 -3 days. What I couldn’t understand is why this was happening! When he was younger he ate whole wheat bread and yogurt everyday without problem. This curiosity led me to read Natasha Cambell McBride’s GAPS (Gut and Psychology Syndrome) book. I also listened to her on Youtube and suddenly all started to make sense. During summer break I put my family on the Full Gaps diet – removing sugar and grains from our diet. My son had a definite die-off reaction – but within a few days he was changed! It was like a fog was lifted off of him. Transitions were easy and I no longer had to avoid noisy crowded places. Soon after I was able to remove all allergy medicine and 70% of the Abilify – he has a sensitive system so I am weaning him slowly. My younger son also had asthma. Before switching to the GAPS diet we used to use a nebulizer at home 2-3 times a week – and mealtime was a struggle. That is now gone as well. No more nebulizer, no more medication, and he eats whatever I put in front of him. To sum up, the GAPS diet has been a miracle for my family. I wish I had known about the GAPS diet sooner. If I had, I would never have put my son on Abilify! Hi Jaclyn, did you find your son was also sensitive to canola oil? And additives like xanthum gum? I just realized his Udi’s GF bread has those in the ingredients. I believe our son is sensitive to corn as well. He checks the boxes on most of the ODD behaviors. He doesn’t have obvious reactions to those, but I definitely try to limit them.